London in the Sky - a 22 capacity, completely open air restaurant that floats above London's skyline - returns this September, with an amazing chef line up for a 14 day pop-up restaurant. 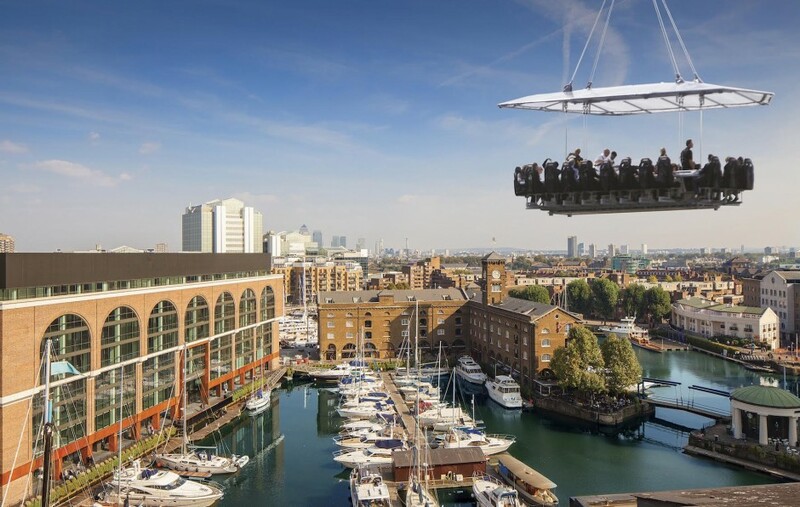 Open to the public, this event will see 11 of London’s best restaurants serve their menus at the sky table which is suspended 25 meters in the air. Tickets have now gone on sale for London in the Sky and are selling fast, so if you want to be part of this incredible experience, make sure you get your tickets soon. Ticket prices include a Champagne Taittinger reception, with lunch and dinners paired with Villa Maria wines. As we all know I'm terrified of heights, but I think even I could get over that fear for one of these dinners. I can't think of a more unique and exciting way to eat food cooked by some of London's top chefs! I know people who went last year and said they had the most amazing time. For more information, or to book you tickets, click the link here, and do let me know about it if you do go!! I know!! Such a brilliant thing to do. It does look terrifying, but you're securely strapped in and it goes up and down between courses for toilet breaks etc!! There's loads of tickets left lovely!! I'm hoping to go, but not sure which flight yet. What an experience - talk about a crazy way to start the day! I know!! Best views for breakfast! I know, I thought about the wind too, but guess they've got plans for that!! It is a bit scary but what an amazing experience it would be! The height thing is a real decider! I'm still undecided as to whether I can actually stomach it... really not a fan of heights but think this would be a bit different.